Hi PISO FARE friends! Do you still need promo tickets? Here is another Cebu Pacific promo fare 2016- 2017 to select local and foreign destinations! The Cebu Pacific seat sale covered trips for November, December 2016 and January, February, March 2017. Booking is ongoing until November 4, 2016. Cebu Pacific domestic promo fare tickets starts at P999 ALL IN for select stations. Other available low fares for local trips are P1,299 and P2,099 for one-way travel. International sale tickets are as low as P1,999 for select flights to Singapore. Fly to Busan, Fukuoka and other Asian cities for as low as P2,699. Limited Cebu Pacific promo tickets! 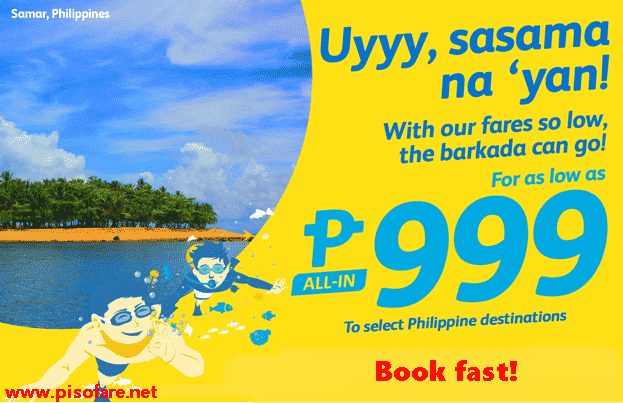 BOOK FAST at Cebu Pacific website! Do not wait until the last booking day as sale tickets might no longer be available. Cebu Pacific promo tickets which is good for one-way trip are inclusive of base fare, taxes and fees, Web Admin Fee and free 7 kilos hand carry bag. Buy the Cebu Pacific sale seats at ticket outlets, booking offices or travel agencies. You may also reserve the promo flights by calling Cebu Pacific hotline at: (02) 7020 888 (Manila) or (032) 230 888 (Cebu). Are you in Metro Manila and do not know where can you buy the Cebu Pacific tickets? Check this POST for the booking offices in Metro Manila. Do you want to travel in comfort? Pick your preferred seat for P200. You may also purchase in advance your Checked Baggage and save up to 50% on baggage fees. As domestic traffic is expected to increase during the holidays, Cebu Pacific announced that they will be adding more flights to the routes: Manila to Bacolod, Busuanga, Cagayan De Oro, Cotabato, General Santos, Legazpi, Naga, Pagadian and Zamboanga. Likewise, frequency of flights is increased from Cebu to these places: Bacolod, Butuan, Cagayan De Oro, Davao, Dumaguete, General Santos, Iloilo, Puerto Princesa, Siargao and Zamboanga. For more promo fare 2017, PISO FARE 2017, travel updates and travel tips LIKE and FOLLOW us in our Facebook fan page: PISO FARE Tickets!! !